When I was training in Vancouver one of my teachers was shot and wounded by a sniper that hid in the bushes near his home. When I was training in Hamilton another one of my teachers was shot and wounded by a sniper. Yesterday a young, moderate, democratic congresswoman from Arizona had a bullet shot through her head by a clearly despondent and widely read young man that lives in her home state. Congresswoman Giffords was literally targeted by Sarah Palin and the Teabagging party because the congresswoman supported health care reform. Take a look at the image below. 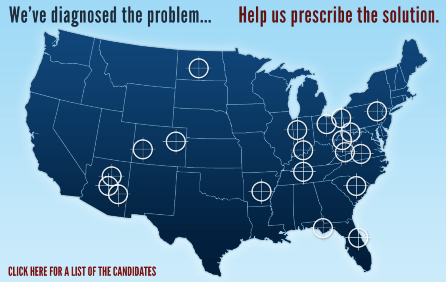 Congresswoman Giffords’ riding (district #8) was targeted with the site of a gun in the picture below. Many people considered the choice of a rifle scope cross hair to identify politicians those who are supportive of health care reform a bad choice that could lead to violence. Since the shooting of congresswoman Giffords the Palin site has taken the advertisement down. Since Ms. Palin’s office was publicly and officially advised of how dangerous the advertisement could be (even by Ms. Giffords herself) is there not a component of culpability in this terrorist act?